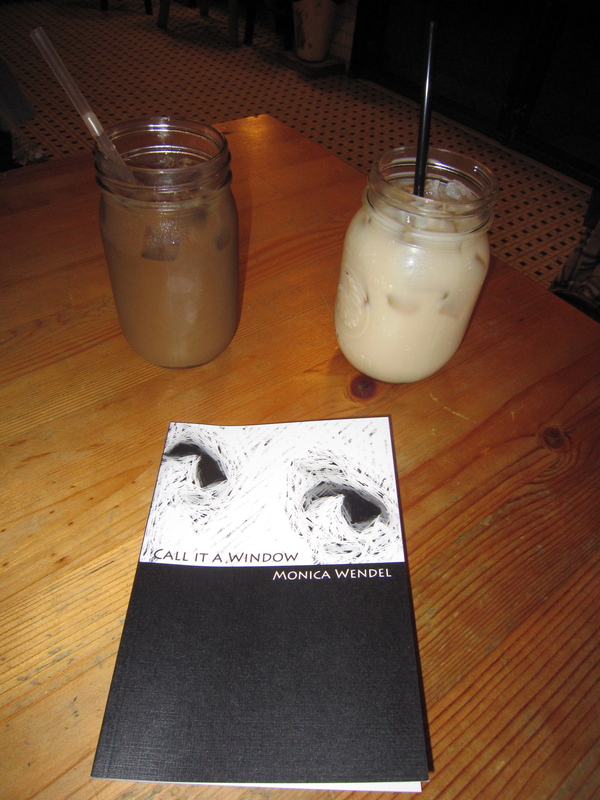 I am extremely proud and excited that my very good friend, Monica E. Wendel recently had her first poetry book, Call it a Window, published by the Midwest Writing Center as the National Winner of the 2011 Mississippi Valley Poetry Chapbook Contest. The book is a chapbook, which is a pocket-sized pamphlet book of poems. 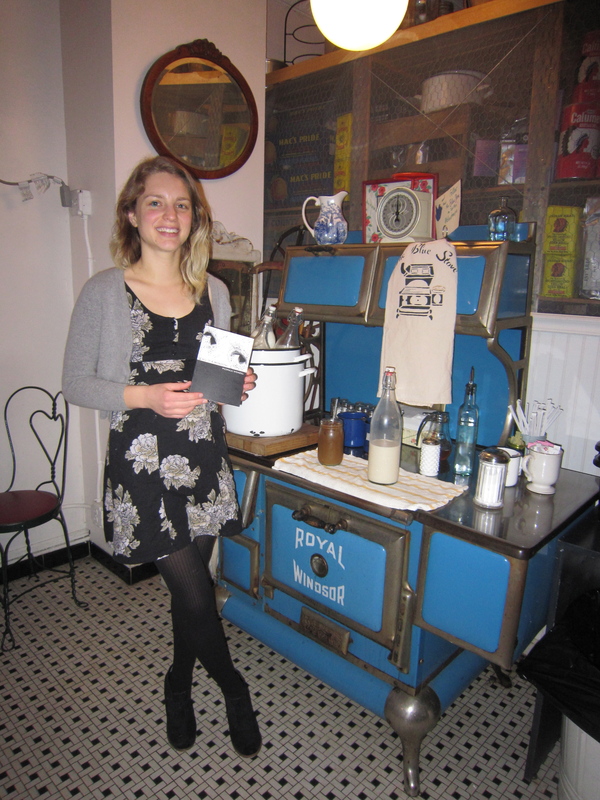 In celebration of the chapbook, Monica and I met up for coffee at the adorable Blue Stove bakery and cafe in Williamsburg, where we chatted about her writing process, inspiration, and favorite New York places. Rose: What is your favorite place to write? Monica: I actually don’t know. For me, the process of writing is really long because I do so many drafts. Even if I write in one place, I always need to revise it in a quiet place. After that, I usually bring it to a group of people for workshop, so it ends up getting written in three places. I tend to write in the mornings first thing when I wake up, usually in my bedroom or living room. Rose: What tools do you use to write? Monica: When I was spending more time on the subway, I was writing in Mead composition notebooks, but now I drive to work. As a result, I haven’t been writing in notebooks so much. I also find it useful to switch up how I write every once in a while in order to keep it fresh. Rose: What poets inspire your work? Monica: My poems owe a lot to Sharon Olds, in terms of their subject matter and their autobiographical nature. My more political poems have a humor in them that I saw in Charles Simic. I don’t think that they sound like his poems, but the wit that he has in his poems and the biting nature of his poems is something that I aim for. There is a clear eye in his poems. They are honest and they cut through a lot of political BS. Rose: I noticed a lot of your poems seem very autobiographical and also sexual in nature, to the extent that if I was you, I might be uncomfortable sharing them with my family. How do you deal with that? Rose: How did you decide to organize the poems by geographical locations? Did you start out with that in mind? Monica: Jon, who I dedicated the book to, always told me that I should try to write poems that take place on different streets in NYC. That project didn’t happen, but I did make a zine called Poetry Maps, where I took poems that I had already written and placed them on a map of NYC. Queens, Man, Long Island. The zine never really went anywhere, but from that the idea of organizing the poems by geography always appealed to me. Where the poems take place is really important to me. Rose: What is your favorite way to spend Saturday in NYC? Monica: When it’s nice out and warm, Smorgasburg in Williamsburg and maybe a ride on the ferry afterwards. That’s a really good way to spend Saturday. I love the whole Williamsburg waterfront. When it’s cold out, my favorite way to spend Saturday is probably at the Met if the subway is running from Brooklyn. I also love P.S. 1 in Long Island City, Queens for when the L train is not running to Manhattan. 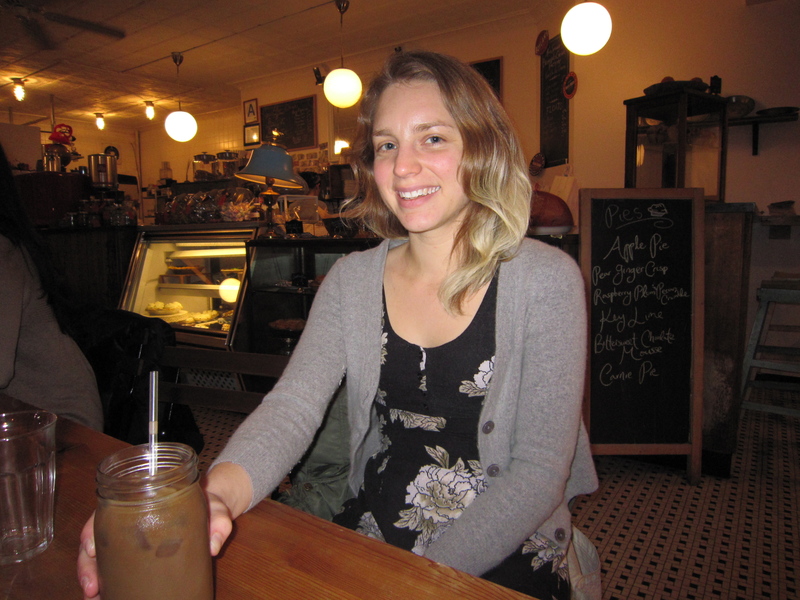 Rose: In your opinion, what are the best restaurant, café, and bar in New York? Monica: Restaurant – Candle 79 on the Upper East Side. Cafe – Variety Cafe in Williamsburg (editor’s note – we tried to go there first, but there were no seats). Bar – probably Grassroots. The bartender there is really really nice and there’s always good people watching and popcorn. Also, there’s a good falafel place next door (Mamoun’s). Rose: I think of you as an unofficial poster girl for your neighborhood. Can you tell me about it for readers? Monica: I live in Greenpoint (Brooklyn), near Williamsburg. It’s in a lot of ways still a Polish family neighborhood. I live next door to a Catholic Church. There’s a poem in the book called “Pope John Paul II Square.” There’s also a ton of writers and artists who live in the neighborhood. It’s relatively cheap, especially for NYC. This is in part because the Newtown Creek borders it on one side and the Newtown Creek is heavily polluted. I live with writers and artists in a house and a lot of my neighbors are writers and artists. The neighborhood cafe, Donia used to have an open mic night and over the summer when I was working on the manuscript I would go there and read poems. I read Call it a Window before the interview and of course I might be biased, but I really enjoyed it. Monica is a phenomenal writer and while sometimes it seems as though she lives in an alternative fringe universe (one filled with radicalism and extreme sexual liberation), the poems are intriguing and leave you wanting to know more. Many lines in the poems resonated with me, even if I occasionally felt outside the world of the narrator. Monica’s chapbook, Call it a Window can be purchased on Amazon here or directly from the publisher here. Some examples of her work can be found here and here.